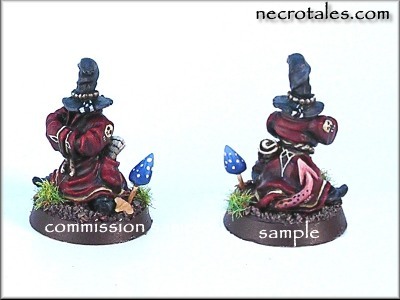 paint miniatures on what is considered a work-for-hire or commission basis. A price list follows with samples of what you can expect for the quoted price. Sample images will appear over the price list if you click on "Sample Image" -- click anywhere on the image to make it vanish when you're done viewing. Please be sure to read the Terms of Service at the bottom of this page. It might seem like a lot of information, but I want to answer as many questions and concerns as possible before you place an order with me. The following prices are based on one level of quality, which is what I would term "high." Sorry, but prices are non-negotiable -- I typically have a lot of work on my table at any given time, but I feel these are very reasonable quotes for the work required. Sorry, but I am NO LONGER taking commissions of any sort. The pricelist is being left for the time being just for my own archival purposes. Add a scenic wooden base with a theme of your choice, fixed or removeable Sorry, but I no longer create display bases on a commission basis. No sample available. Additional components for special themes (such as pieces from plastic kits or vehicles, additional metal figures or familiars on the same base, furniture or columns on a scenic base, etc) Sorry, but I no longer do any modifications on commission. No sample available. Squads of ten or less, identical colour schemes Sorry, but I no longer accept new commissions for squads. No sample available. Please be sure to review the samples and the Terms of Service before contacting me for commission work. There are a huge number of other samples in the main gallery. 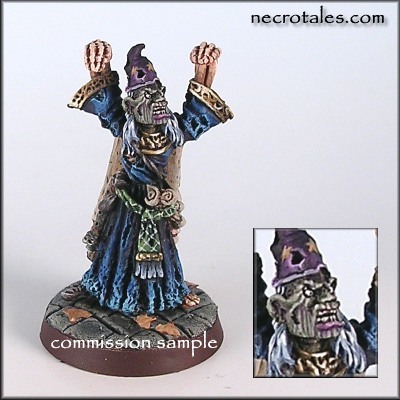 Prices do not include the cost of the miniature. You can provide the miniature if you wish (with postage cost and responsibility being yours), or I can acquire most of the popular store bought brands (Games Workshop, Rackham, and Reaper in particular) at cost. At least 50% of the full payment is expected before I can begin any work, with any remainder paid before I can ship the finished project. My preferred and recommended method of payment is PayPal, but I will accept personal checks and money orders. I must insist on waiting until any personal checks clear before beginning work, which can take one or two weeks depending on the bank(s) and post office. I will of course contact you if there is any problem with payment. 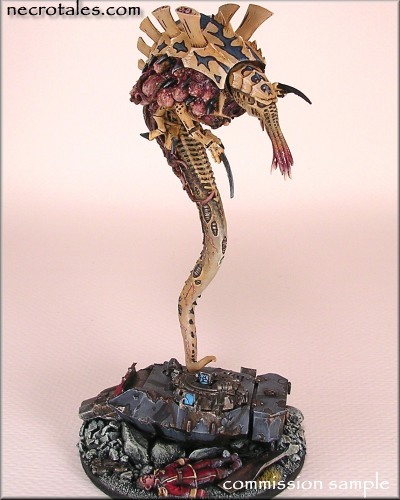 Please provide information about the desired colour scheme or styling goals of the finished miniature and I will do my best to match your vision. Exotic freehand may increase the price due to the extra time. I only paint using metallic paints for commission work -- sorry, but I no longer have the time necessary to devote to non-metallic metal (NMM) work. All miniatures are based on round, square, or "War Machine" style bases at your option. The terrain of the standard base is also at your option and is included in the price of the miniature -- none, stone, grass, snow, etc. I will also happily place figures on resin bases if you so wish, which are covered under "additional components." I am often working on multiple projects at once. 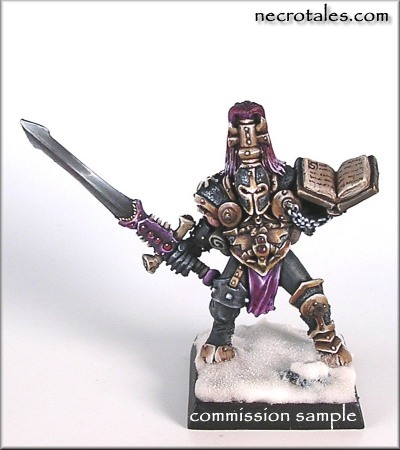 Therefore please allow at least one to two weeks for me to complete any given commission from the time I receive your miniature. I will quote you an expected turn-around time when you make the commission request. Sorry, but I do not do conversion work on commission. Cleaning and priming the figure is of course including in the cost. When a commission is finished, I'll provide you a picture (usually via a link to a private area on the site) so that any minor changes or adjustments can be made before I ship. You will need to sign off on this proof before I ship. 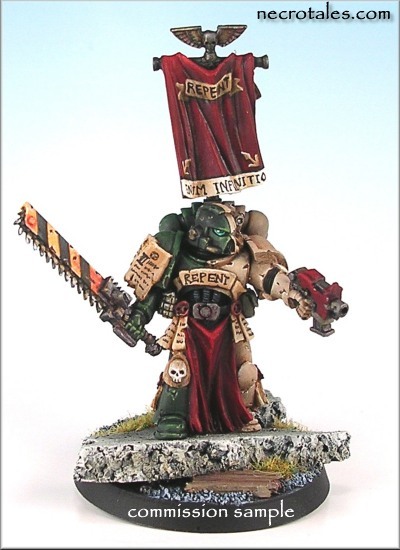 refund 50% of your payment and return the miniature in a stripped condition (if we are for some reason unable to come to an agreement with the above options). Sorry, but I can not refund prices after I ship. As you can see, I want to make sure that we're both pleased with the finished work. Miniatures are packaged with foam rubber, and sealed in a sturdy corrugated cardboard box for delivery via the USPS. I always use Delivery Confirmation (domestically) or a Certificate of Mailing form #3817 (internationally). Shipping within the US is included in the price of the miniature but international shipping costs extra; please contact me for details. Insurance is also extra, but will be at cost. I'm happy to upgrade to another delivery service (such as FedEx or UPS) at your request and at cost. Due to eBay rules, I can not accept new commissions while I have active eBay auctions. And, finally, I can only accept commissions from those age 18 or older, please. If you are under 18 and want me to commit to work for you, I will need written authorization from your parent or guardian.